It's been a while, but I'm back with a brand new post for you, filled with old content you've already seen! 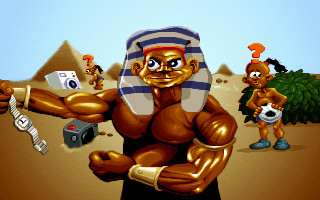 It's the seventh annual Super Adventures Screenshots Animated GIFs of the Year, featuring some of the very best images from the last 12 10 or so months of my site. I have to be honest, this is going to be a much shorter post than it's been in years past because I just didn't have many games to pick from. I've only made 32 posts this year and one of them was a message reassuring people that the site wasn't dead, followed by a list of games I promised I was going to write about and then never did. Well, to be fair I did manage to get around to half of them. Speaking of things I'm not going to be writing about in the future, there'll be an important announcement at the end of this article and it's not good news. So be sure to stick around for that... or just scroll down and read it now and then scroll back for the screenshots afterwards, either's fine. All game links will take you back to the original Super Adventures game article, so don't worry about ending up on Amazon or something. Wait... I could've had Amazon affiliate links all over my site this whole time and made 3% on every sale! Oh no! The first screenshot I've got for you is this fantastic portrait of Tales of Symphonia hero Lloyd Irving. I think it really captures his steely determination and absence of deep thought. This is a bit of a long scene from Spy Fox in Dry Cereal, but when I've got a GIF featuring a fox doing backflips I've got to use it. Though I should point out that I edited it a little to remove the cow's long descent to reduce the filesize. This was by no means an attempt to undermine or misrepresent the original developer's artistic vision. (Though I totally think it's funnier this way). 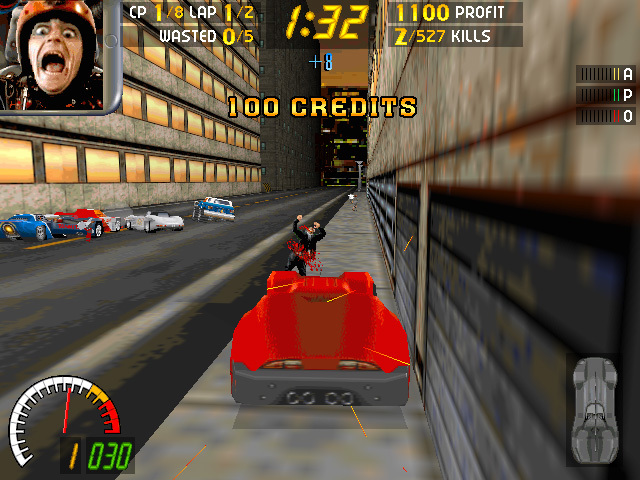 Carmageddon's not the prettiest game to come out of the late 90s, but I love Max Damage's expression in the top left as I Death Race 2000'd this gentleman with my spiky automobile. He's got some great faces that guy. 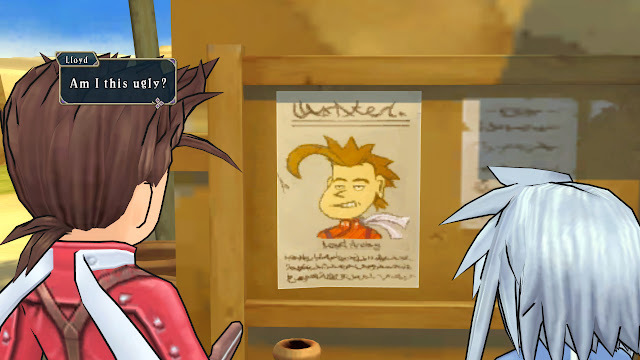 Here's some Super Adventures trivia for you: I actually started this 'Screenshots of the Year' post way back in January because I needed to be absolutely sure that this picture ended up in the list. Not that I was ever likely to forget it. Occasional Super Adventures commenter Kelvin Green described this gentleman as being like "Vince McMahon, off of the wrestling," and I see what he means. I could go on showing screenshots from Zelda wannabe Legends, because the art in it is incredible (for many reasons), but that wouldn't be fair on all the other games. I will show one more though, because I saw this loading screen about 300 bloody times and it's only fair that you see it a few times too. I only played one game in February, so here's a GIF of my fluky escape in Psycho Fox on the Master System. I guess that second pogoing mushroom must have been overlapping the pillar by a pixel, saving me from instant doom. Yay for 80s collision detection. Nah that was totally justified, the game's a legend! 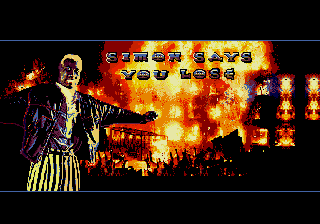 Demolition Man on the Mega Drive/Genesis is a fantastic looking platformer with some top quality pixel art. Mostly. (The SNES version of the screen's just as bad if you're wondering). I love the chicken's expression as he no-sold all my apples in James Pond 3: Operation Starfish on the SNES. I just wish I actually liked playing the game as well. I finally played Day of the Tentacle this year, so I get to show Bernard losing a fight against a clown. It's not the funniest moment in the game, but it works so well in a GIF. ....here's a few seconds from the new Doom. It's an immensely pretty game but screenshots don't do it justice. Neither does crappy low res video to be honest, but I try to be considerate with the filesize of my autoplaying clips. I'm just going to sit and watch this loop for a little longer. It was tough just choosing one GIF from the anime-inspired intro to Wolfchild on the Amiga, so I went for the one that came with 12 other screens. If there's one thing I appreciate about Star Wars: Rebel Assault II, it's that it treats the source material with absolute respect and reverence. Also, the guy who did the subtitles can spell good. 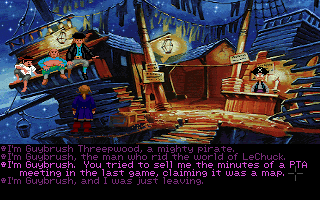 There's nothing overly hilarious about this shot, but it's got pretty artwork and there's no way I was ever going to leave out Monkey Island 2. 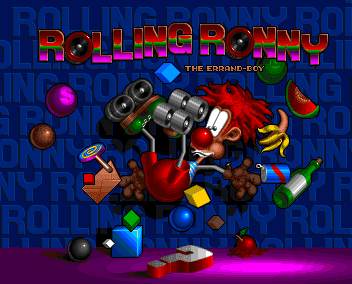 I couldn't leave out Rolling Ronny on the Amiga either. In fact, this title screen belongs in an actual art gallery, so that people smarter than me can properly analyse it, and discuss its themes and what it makes them feel. I'm just going to skip right past July and move onto Ganpuru: Gunman's Proof on the SNES. It's a reasonably fun little Zelda shooter this one, though I probably would've enjoyed it more if I spoke Japanese. On the other hand, I think I'm probably better off not being able to understand Teenagent in its native language, as the slightly-off translation just enhances the weirdness. 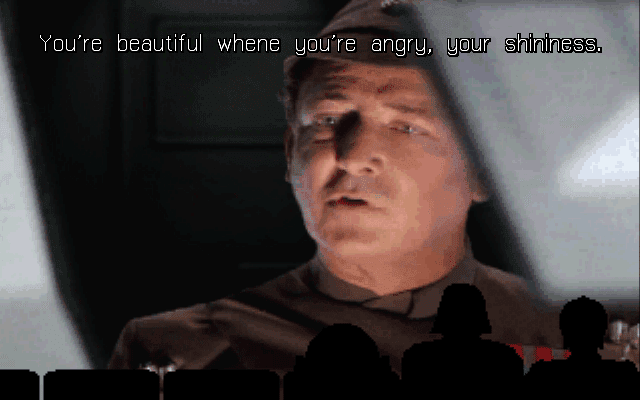 Not that there's anything off about the dialogue in this beautiful little comedy scene. Who doesn't love the old 'you mean I went through all that effort to get you over that wall and you could've just walked around it the whole time' gag? Secret of Mana's such a pretty game. I didn't actualy enjoy playing it all that much, to be honest, but I've no complaints about these visuals (Seiken Densetsu 3's prettier though). I hate you Bill's Tomato Game. I hate you so much. I hate the wizard in Bob's Bad Day as well. Bob may have been a little sarcastic with regards to the comedy value of the sorcerer's surprise appearance, but he didn't deserve to have his head torn off and thrown into 100 levels of screen spinning, maze solving, collect 'em up action in the billboard dimension. What's a teleporting wizard doing at bus stop anyway? He can teleport! 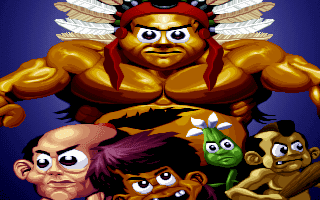 Speaking of classic Amiga intros, the 3D rendered cutscene in the CD32 version of mascot platformer Zool 2 has some strange charm to it as well. I mean who doesn't want to watch the guy repeatedly knock himself out cold? And I'll finish the article off with a bit of dog dunking from Broken Sword II: The Smoking Mirror. Mainly because it's the last game I played this year. I've got no November or December screenshots to show you I'm afraid. 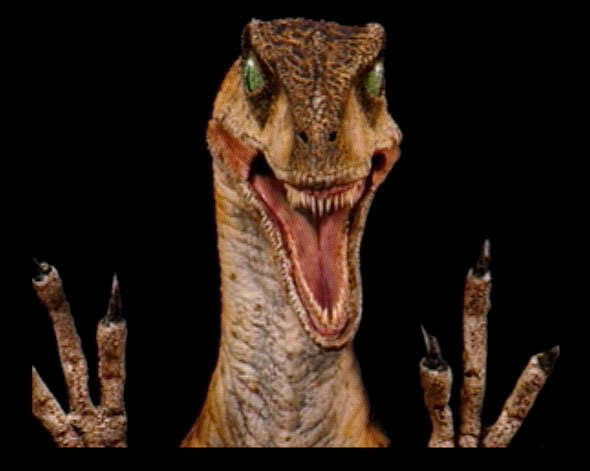 Actually here's a classic 2011 screenshot of a raptor from Jurassic Park Interactive on the 3DO just for old time's sake (and so you don't have a distracting animation on screen when you read the rest of the text). Super Adventures has never exactly gone to plan, but there's always been a plan: a spreadsheet covered in games and game categories stretching for months in advance. Even when I realised I wasn't managing to get as many posts out as I used to, I figured I could at least keep the pace going until the end of January next year so I could reach the site's next anniversary. Didn't quite work out like that though, and I'm more frustrated about that than anyone. Before Super Adventures in Gaming, there was an Adventures in Gaming forum thread, and before that I just used to bother my friends with screenshots and dumb comments on IRC, so this site was really just supposed to be way for me to show off weird screens and interesting games. But thanks to your feedback I began to take Super Adventures more seriously and started to stick with games way longer than I ever used to. Hours even! Having a reason to play games other than my own entertainment actually helped me get more entertainment out of them and I got to whine about all the things that have been bothering me over the years too. That more than made up for the time spent getting those bloody animated GIFs looping right. But after a few years of writing up a game every week the site stopped becoming something I was doing for fun and started becoming more of an obligation, to myself and to you readers. I felt I had to keep that momentum going and give you folks something new to scroll through each week; not that I wasn't happy to keep going with it and carry on ticking games off the list. Trouble is that when your heart's not in something it starts taking longer and longer to get it done, and I've got Sci-Fi Adventures to find time write for now as well, so all those plans and promises of mine fell apart. It's not even an issue of 'life getting in the way' I just don't have the time to keep writing something that now takes me forever to write. Plus several people have pointed out that my articles haven't been as funny as they used to be and you can tell I've been forcing it. I guess 1000 games was my limit. 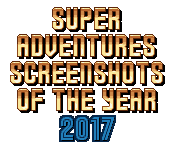 In conclusion: 2017 wasn't Super Adventures' best year. But was it Super Adventures' final year? Yeah, I'm afraid so. Well, it's the final year I'll be writing for the site regularly at least. I need to take time off and hopefully recharge my enthusiasm for video games, so that next time I reappear and write about a game it's because I want to and not because I feel like I have to. Though even if I never come back, the site's not going anywhere. All the old posts will still be there, even the ones I regret, and I'll not be letting the spam bots claim my comments section. I'm very fond of my comments and they'll not have it. So massive thanks to everyone who's been reading and additional thanks if you've ever left me a comment as well. You're the ones that made this into a video game site instead of the ramblings of a lunatic ranting only to himself about games that are literally decades old. You guys win the prize. If you want to make sure you don't miss out on possible future posts you can subscribe to the RSS feed or follow me on Twitter, or just drop by every now and again. Maybe I'll have something new for you someday. Until then you can go bother VGJunk at his very similar blog. Oh and Happy New Year! Also, Merry Christmas, seeing as I missed that one. Thank you for everything you've done all these years. You sparked on me the flame of retro love and that's never going away. You deserve a very well earned rest. Thanks for all the great articles! Take care of yourself! Great work all these years. Obviously we hope that you'll do more, but as you said, it's got to be because want to. I remember the first SAIG article I read: the one on the game Oscar, I immediately loved every word of it and kept coming back every day. Thanks for all those years. Well done and well deserved. I've been reading for about four years; it's always been good on a commute home to pop up my SAIG bookmark and see if a new review has come in. Really it's amazing you've kept it going for so long, I'm certain there's plenty in the archive that will keep me going for a long while. Good luck with Sci-Fi Adventures; hopefully we'll see you back here again one day! Good luck, I understand your state of mind with this, I have the same feelings with neverending ongoing projects. In general, after a couple of months, the tickle to return kicks back. Happy new year Ray! I want to thank you for your excellent writing, the jokes, the laughs and this constant feeling of expectation for your articles. It will always be a pleasure to hear from you. He really does look like Vince McMahon. I hope it is going to be a case of rest and recharge and that you'll be back one day; I'm sure you haven't covered every Amiga game yet. But if not, thanks for all the reviews. They've been great. Thanks for all the articles, it's been fun. It has been a fun ride :) I loved your dedication and kudos for your honesty. Wow, the end of an era. I enjoyed each and every article over the years I’ve been reading. Thanks for all the laughs! Also, thank you for covering one of my all time favs, Skyblazer! Good luck in all your future endeavours, and I hope to see you around the internet. you have done a great job with all these deep reviews, and deserve the prize yourself!!! Thank you for all the articles, the bonkers screenshots and all the fun (and also thank you for the shoutout at the end there.) I hope one day you return refreshed and rejuvenated, but if not I shall always think of SAIG whenever I see a James Bond game or Final Fantasy XII, because I still think about that dramatic tomato hunting screenshot every now and then. Take it easy! Sad to see you go man but understand the reasons. This site was a must check over the years. Thanks for all the effort you put in and the pleasure you gave us lot! Been reading your site for years and loving it! Some of your posts have introduced me to games I've grown to love, that I might not have tried otherwise. So I just wanted to say thank you for that, as well as just the sheer entertainment and laughs I've gotten from your posts! Remember, only return when and if you want to. You'll write better, funnier articles that way. And if you don't, no problem, because your Sci-fi adventures blog is just as great as this one! You put your heart into what you did, and laid it down when the time came. That's a job well done. Congratulations! Feels a bit silly to get dramatic over a video game blog, but it's true. Cheers. I just came back after about a year, to find that it’s all come to an end. Thanks for all your work on this over the years. It’s been a great read. I just noticed this post. Somehow, I was so busy during my holidays that I forgot to read my feeds. I never got the news about your retirement and I came here to see if you were fine. Thanks for everything, you are awesome. I started reading this blog as a teenager and I'm a grown up adult now. You contributed to that transition to some extent I guess. Greetings and have a good life. See ya! I have just finished reading Your site from the very beginning to this point. It took me a month or maybe a little longer to read all those articles posted through the years. I only regret i discovered this site recently. If you still reading comments here, i’ve got just one thing to say: You did hell of a good job here. There are so many awesome articles to read. I hope You will return from time to time to write another article or post some screenshots and write few lines under them... But only if you want to, that is :-) Best regards to you. I started reading SAG in 2013, towards the end of eighth grade. I remember staying up all night reading article after article. Though much has changed since that time (including the frequency with which I check this site) my love for your articles has not. Thanks for all the years of amazing content, Ray. You've abandoned Super Adventures in Gaming for a year now! What is the meaning of this? You keep posting science-fiction reviews so I know for a fact that someone using the designation of your Carbon Unit still functions. I know you're a better gentleman than this, sir. Turns out that I'm actually a rubbish gentlemen who hit his word count limit on writing about video games. I can't actually write a single extra word on the subject or else my brain might turn to liquid and ooze out of my nose and ears. But it's awesome to know that if I did write more someone would be around to read it. you could try the fan translation of Ganpuru: Gunman's Proof! wait a minute, fan translations break rule 2. well then i suggest ummmm The Divide: Enemies Within!